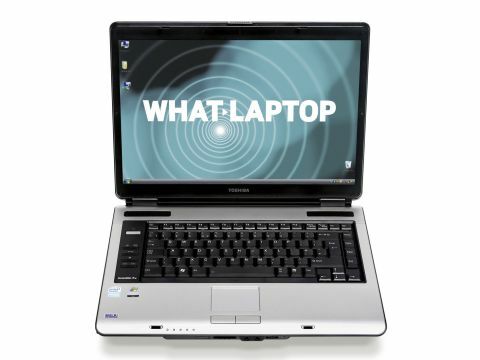 The Toshiba Satellite Pro A100-908 (£380 inc. VAT) takes a standard chassis that is available in a range of price points and configurations and makes it affordable for just about any budget. The chassis is a reasonable weight, weighing in at 2.8kg. While we only managed to get a little over two hours from the battery, as long as you're not expecting to be writing for long periods while on the move, it'll suit the casual user. The build quality is good. The body and lid are made from plastic, which means there is a degree of flex to the lid, but for the price we found this a tough and robust chassis. The machine is dominated by its 15.4-inch widescreen display. While it lacks a Super-TFT coating, we found the screen certainly bright enough for the price. Supported by an integrated graphics chip, you won't be able to do anything too taxing on this system. This resulted in the system having a Windows Experience Rating of 2, which is below par for running Windows Vista at full detail. Pre-installed with Windows Vista Business, the first thing you'll notice about this machine when you boot-up is how long it takes. Vista is far more resource-heavy than Windows XP, so the use of 512MB of memory is too little to run the OS properly. If your needs are basic, you'll find once the OS has loaded things work fine, but we'd recommend upgrading to 1024MB of memory as and when funds allow, as you'll see the performance of this system improve. The Intel Celeron M processor may be considered an entry level chip, but it's great for those who only need to run basic tasks, as you won't be paying for power you won't use. When it comes to working, you can use this laptop for word processing, browsing the internet or for watching DVDs and listening to music. When running basic tasks, this machine ran comfortably, but things started to slow when more than one window was open. Toshiba has added a row of media buttons down the left-hand side of the main board. They can be used to start Windows Media Player and then control volume, as well as stop and start movies and music. This works well, especially when you're using the laptop in a cramped space, such as on the train, but it does affect the amount of space for the keys. However, we found we quickly grew accustomed to the rather cramped keyboard and, while they aren't the most robust of keys, it's a reasonable quality keyboard for the price. The Toshiba Satellite Pro A100-908 is a decent machine for the money. As long as you're not looking for cutting-edge performance, and with a memory upgrade, it will serve you well.